My most relaxed Sundays are those when my hubby volunteers to cook. He’s as much a foodie as I am & loves to cook authentic Mangalorean dishes (he leaves the experiments with other cuisines to me). Of late due to his busy schedule he prefers to relax on Sundays, but one such Sunday when he did give me an off from making a special Sunday lunch saw him making some noises in the kitchen. Some slicing & stiring later I got to eat some delicious Beef Sukka. 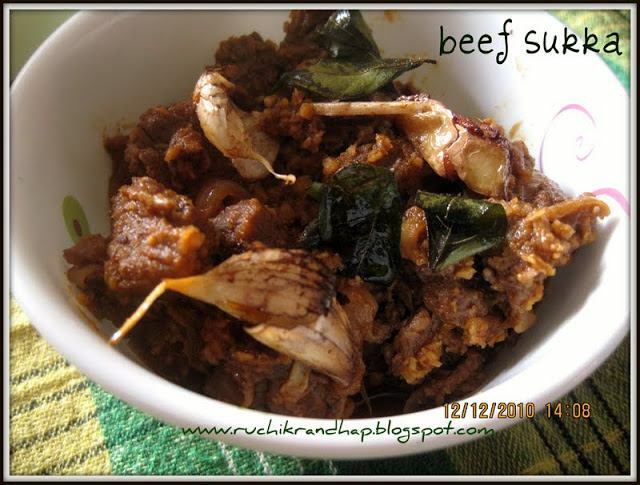 This is his favourite dish although I prefer eating red meat very occasionally, but I must give credit for the way he makes it…so here’s his version of the Beef Sukka. 4. Add grated coconut* and toss till you get a nice aroma for about 2-3 mins. 6. Add the stock and salt to taste and cook for another 5-10 minutes. Awesome look Shireen!!! I love the personal feel…:) Keep up the good work!!! Thank you . I made it today and it turned out good. Keep posting.